There are some places that just give me a “spidey sense” that there is something secretly going on there archaeologically. The area around Sandstone Peak in the mountains above Malibu really sets off my radar. 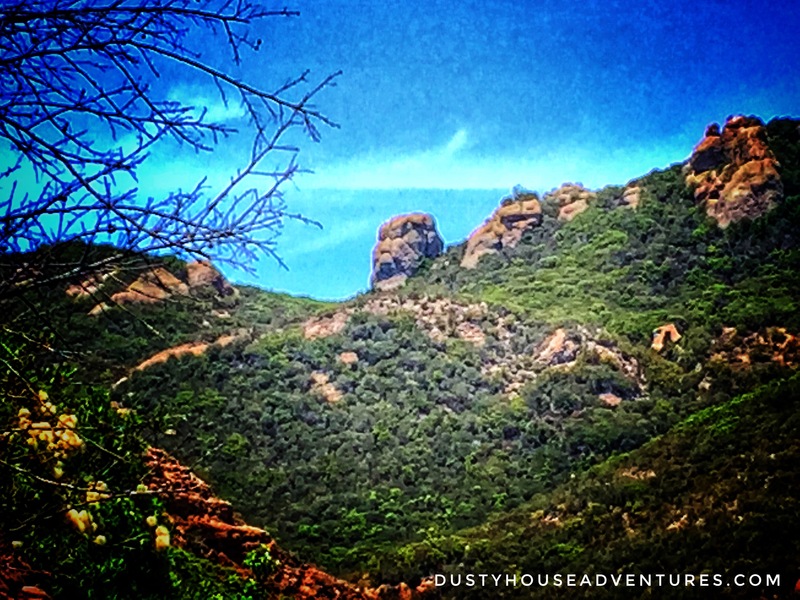 Sandstone Peak is the highest peak in the Santa Monica Mountain Range. In addition to that, the Mishe Mokwa Trail (White Man’s Trail) that loops around the back side of the mountain on the way to the peak is one of the most eerily beautiful hikes in the range. From the trail, one looks across the gaping chasm of Carlisle Canyon to Balance Rock teetering on the cliff on the far side. It is regal and speaks volumes about the eons of erosion that stretch before and after this moment we tread. On my birthday this year my husband really stepped up his game and planned a day for me that would make every moment fun. He packed a sushi picnic for us and we took a hike down the Mishe Mokwa trail which he had never seen before. (He was going to take me to watch the whales at Zuma Beach, but it was too foggy.) It was fun for me to watch him experience the views across Carlisle Canyon while I sat on a rock and pondered the scene that I’m currently so fascinated with. I contemplated Balance Rock, the sandstone cave overhangs along the ridge at the top of the canyon, then saw a monkey face staring toward the ocean. At the head of the canyon, on the high ridge, I saw a large boulder that looks like the face of a monkey or a very fat squinty-eyed man staring out toward the sea. (The pic of this is above. Unfortunately, the resolution isn’t great because its a zoomed-in iPhone photo.) I mean, seriously, if you were a prehistoric person, wouldn’t you go right ahead and believe that this place full of the highest peak in the mountain range, natural monkey faces, and balancing boulders had special powers? I feel that it has special powers and I’m not even prehistoric (just imaginative). This day out with my husband was actually my second day in a row visiting Carlisle Canyon. The day before I’d dragged some friends out with me. Two of us actually went ahead and crossed Carlisle Canyon to hang out with Balance Rock up close and personal. I also wanted to get a look at the Mishe Mokwa Trail side of the canyon from the point of view of Balance Rock and inspect the whole canyon with my binoculars. We couldn’t push it over. My spidey sense for spiritually powerful sites prompted me to do some research into recorded archaeological sites in the area of Sandstone Peak. Indeed, somewhere in the vicinity there is a pretty spectacular pictograph cave that very few people know about. I have yet to pin point it, but I will. I have ideas, but will not tell. It isn’t actually in Carlisle Canyon, so don’t start falling over cliffs looking for it. In the meantime, it is enough just to feel the power of the place and to eat sushi on the trail with my husband who loves me. I mean, a husband who cheerfully packs sushi picnics? What more proof do you need that magic exists? My friend Angus Oblong drew this portrait of our family for a birthday gift. It includes our new hound, Cozy. Isn’t it the best?! As an aside, you should visit his website www.angusoblong.com, it is totally hilarious, especially the page about how you can hire him to stand at the foot of your ex-girlfriend’s bed in the middle of the night wearing clown make-up, then when she awakes in fright he will slowly turn and walk away. Now THAT would be the best birthday gift ever! Well… I did find some caves that were clearly habitation sites, but I haven’t found the pictographs. I wonder if they have been eroded away by now? 203 and 242 are still there. The latter of the two is in great shape. So good that I questioned the authenticity of the pictographs. It’s a very well hidden site.